while waste is being processed at Montgomery County’s Shady Grove Processing Facility and Transfer Station or Resource Recovery Facility. The danger is that when these types of items are mixed, or come in contact with, other substances that could be in the trash, the combination can be volatile and catch fire. These items should be properly disposed in Montgomery County’s Household Hazardous Waste Collection Program, or other special collection processes available at the Shady Grove Processing Facility and Transfer Station. Download the educational postcard that was distributed across the County. 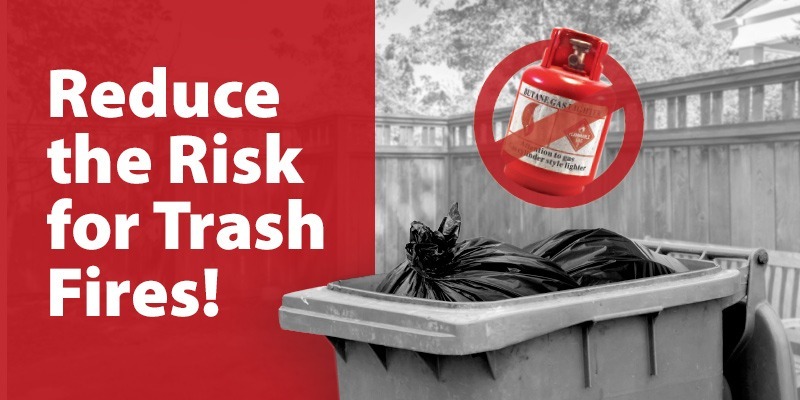 2 comments on "Don’t turn your trash can into a fire hazard"
This post is very informative! A lot of people die each year due to fire accidents so it is very important to aware people about maintaining safety at home or workplace to ignore fire accidents. There’s an abandoned house across the street that caught fire and did significant damage if not totally destroyed. The house was abandoned in August of 2018, eight months ago. The utility companies turned off the water, gas and electricity when it was abandoned. Cause of the fire has not been determined. The tenant/owner left the house in very bad shape let alone not emptying everything out. The house is forty-five years old and was condemned three years ago! The garage is packed full of bagged garbage because the guy wouldn’t pay for garbage pickup. It is absolutely pathetic. Rumors are flying around on what could have caused the fire. Obviously the gas and electricity is out of the question. Is it possible that there could been garbage in the basement that could have combusted and stench had been the problem? Would the stench become combustible if the garbage is piled in layers over a period of time? Rumors have it that the fire was started in the basement. Or, could it be arson?? ?